Animation and on-location photography blends together for a custom and entertaining commercial spot. How do you attract attention in 30-60 seconds? This is how much time the average national television commercial gives companies to promote their product. Vsurance, a health insurance company geared towards pets, posed this question to Dynamic Digital Advertising for their latest marketing campaign. Vsurance calls themselves “the company for people who think pets are people too”, and so it was only natural to combine pets and people in their promotional video. The real question was how to do so in the most unique way that will gain attention and motivate people with pets to contact the company? DDA proposed producing a video that not only mixed people and pets, but animation and onlocation footage to create a multi-media piece that was as distinctive as the company itself. In producing this video, DDA professional videographers went on-location to New York City to shoot the real footage of traffic and pedestrians on city streets. Most of the footage was seen from a pet’s point of view. A lot of legs, feet, and street were focused on as the main characters strolled through the crowd. Meanwhile, in DDA’s studios, our professional designers created handdrawn illustrations of the two primary canine characters. Once the illustrations were complete and approved, DDA animators took over and gave the drawings form and function. 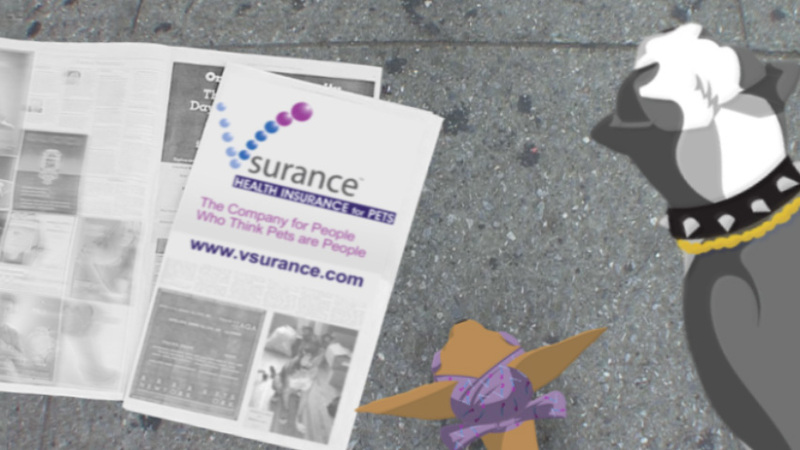 The on-location footage and animations were then integrated together with voiceover narration and the Vsurance logo seen in billboards, newspapers, and on public transportation to make the commercial complete. As with all projects, DDA Video worked very closely with the client throughout development to conform to specific guidelines and to meet and exceed goals, all while offering our own suggestions and feedback to enhance the overall animation. Created for a national television spot, this Vsurance commercial combines hand-drawn illustrations, real-life video footage, and 2D animation to create one fun and very entertaining ad for pet insurance. This animated commercial was done on a very short deadline with just a few weeks between the start of the project and completion.